Now that may be even more true. 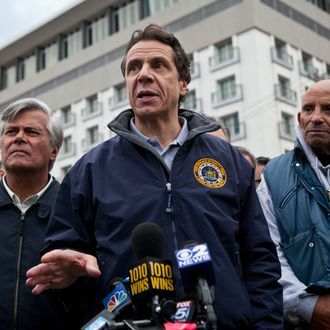 On Tuesday Governor Andrew Cuomo announced that he’s established a commission to review the response of New York utilities — including LIPA, the New York Power Authority, and Con Edison — to Hurricane Sandy, Tropical Storm Irene, and Tropical Storm Lee. At a news conference today, Cuomo reminded everyone that he “talked about consolidating LIPA and the other energy agencies in my campaign two years ago,” but sidestepped the suggestion that he probably should have done more to fix the troubled utility in the 22 months he’s been in office. About 90 percent of LIPA customers lost power at some point during Sandy, and Bloomberg Businessweek estimates that of the 106,000 homes and businesses that still don’t have electricity, 53 percent get power from LIPA. Following Irene, a state public commission report warned that LIPA’s computer system was obsolete, it had an archaic paper system for tracking storm damage, and the agency neglected to perform routine maintenance, like replacing rotten poles and trimming trees around power lines. On Tuesday two customers filed a class action lawsuit against LIPA and National Grid, the U.K.-based firm that operates LIPA’s network, over failures related to Sandy. CBS New York points out that Cuomo didn’t take action following the state public commission report, and had the opportunity to appoint seven members of LIPA’s fifteen-member board and its chairman, but filled only one slot. Cuomo suggested that there was nothing he could have done. “LIPA did not work for many, many years,” he said. “It was fatally flawed. It was without function. I believe LIPA has been beyond repair for a long time. I don’t believe you can fix it, I believe it has to be overhauled and you need a new system.” The new commission is expected to release its recommendations for reforming New York’s power system early next year.